Leading Manufacturer of brass earthing accessories from Mumbai. 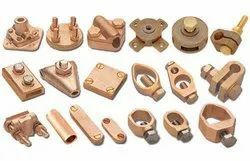 With enriched industrial experience and knowledge, we are trading a wide assortment of Brass Earthing Accessories. Any kind of Earthing Accessories can be developed As Per Customers Specifications.